Regional Cakeathon V: Virginia Apple Pudding - Food, Drink, Photography, and other things. When I started this exploration of regional foods, I wanted to mainly do British recipes but every now and again I have to look further afield for inspiration. 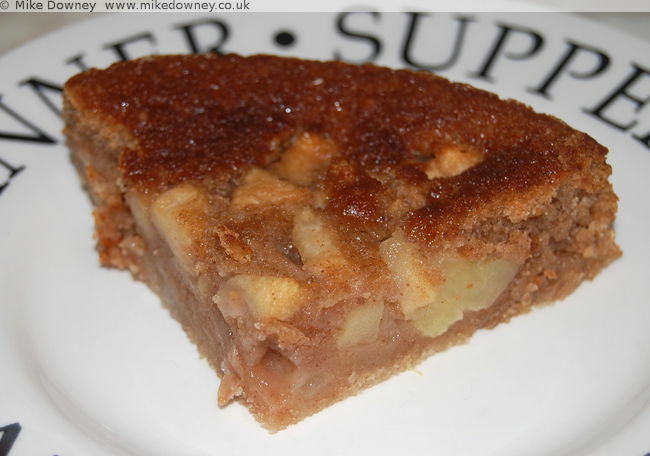 The Virginia Apple Pudding is a moist spiced apple cake and is very easy to make. I found several recipes, most of which were adapted from the same source. I made a smaller version, with more cinnamon and a mixture of apple and pear. I followed the original recipe fairly closely: Beat together everything apart from the fruit and cinnamon. Put the last 2 ingredients in a bowl and microwave for a couple of minutes to soften the fruit. Pour the batter into a cake tin then spread the spiced fruit on top. Bake in the bottom half of a pre-heated oven (gas mark 5) for about half an hour. After last weeks sago fiasco, this was a lot more successful. The cake was moist, tasty and had just the right amount of spice (I may have mentioned before that I believe most cake recipes under-use cinnamon and tend to increase any quantities given).